Over the last few days, we, a group of Hong Kong people, believe that many locals have been inspired and touched by people coming here from around the world to challenge the WTO. We have been deeply moved by them, too. Traveling from afar, friends from Korea have brought us beautiful rhythms, songs, and stories of their struggle and suffering. The Korean farmers and workers have expressed great kindness in the face of their demonization by the media and government. The sincerity embodied in yesterday’s march – whereupon they performed a full-body bow every three steps, bowing the distance from Victoria Park to outside the Convention Centre – clearly moved the people of Hong Kong, bringing some onlookers to tears. In their steps and bows, we can see strength in humility, the true power of a people. After their pilgrimmage, the Korean farmers and workers treated us to their dinner of Korean rice at the protest area. After benefiting from their generosity, we thought of the rows upon rows of police barricades and the overwhelming power of the establishment that they face just to get their voices heard. We are a small group of Hong Kong people. What can we do to support the Korean farmers? After serious discussion, we decided that the only way to support them is to go on hunger strike. We resort to hunger striking because we face an extremely violent power. We have no choice but to use our own bodies as weapons. Hunger striking is a most peaceful yet powerful form of protest. The restricted zone outside the Convention Centre used to be a public place, belonging to the people. Now, the government has surrounded the restricted zone with fences and police barricades. The restricted zone is unjust because it only serves to protect the world’s most powerful governments and capitalists, allowing them to meet in safety and secrecy. They meet inside closed doors, without having to listen to or consider the real voices and stories of the people whose very lives their policies affect. As hunger strikers, we have chanted and marched and written about these issues, but the police lines blockading the Convention Centre from the people outside are rigid and unmoving. Corporate power does not respond to people’s suffering and demands. We have no choice but to hunger strike. The WTO’s Agreement on Agriculture (AOA) not only harms the Korean farmers who are now at the front lines, but countless others around the world trying to maintain their livelihoods, such as fisherfolk, peasants, and other groups. These traditional ways of life are oppressed by capitalism and free trade, and are in danger of disappearing. Compared to these serious threats, our suffering, as Hong Kong people, is miniscule. Our actions are small. However, besides hunger striking, we have no other way to express our respect towards these peoples and concern for the suffering. We also have no other way to express our anger towards and resistance of the WTO and the Hong Kong government, which is equally complicit in crimes against humanity. 3.That the WTO delegates remove the items of agriculture and fishery off the agenda. They need to take the needs of the poor seriously, since food is a basic right. At the same time, we sincerely hope that Hong Kong people can join us and support us. 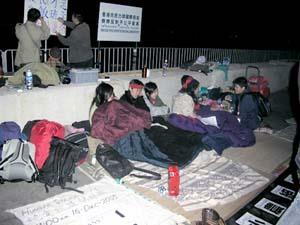 We hope that Hong Kong people will contribute to the life and dignity of our friends from overseas.